People say that we never stop learning about horses, and we totally agree. All the time we spend with horses we are analysing their behaviour and health; finding out what works and what doesn't in different situations. If you are a novice horse owner, or even experienced one, we recommend you take a look at 'The Ultimate Guide to Horse Health'. 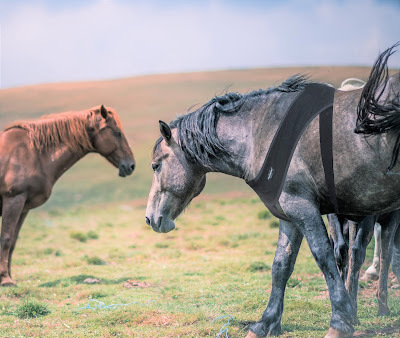 This useful tool, which has been put together by our friends at Horsemart, can help you to optimise your horse care and prevent health issues. Sometimes, the extent of our knowledge just isn't enough and we have to rely on technology to monitor our horses health. Technology has come a long way in the past decade. 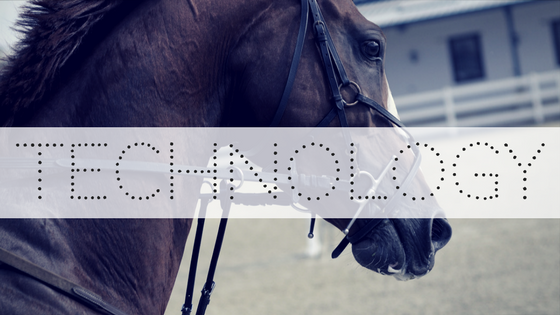 Below we have listed six influential tech innovations that have benefited the equine industry in the past decade, before taking a look at how Trackener's technology can revolutionise horse health! In recent years technological advances have made veterinary diagnostics easier and more accurate. Magnetic Resonance Imaging (MRI) is a popular diagnostic tool that has been used in human medicine for many years, and now increasingly within equine medicine. It's main challenge with horses has been its practicality, as it requires a full anaesthetic to scan separate body parts in a scanner designed for humans. Thanks to an innovative design by 'Hallmarq Veterinary Imaging' this impracticality is no longer a problem. The standing equine MRI scanner operates whilst your horse is standing up and only under light sedation, reducing the risk significantly. This type of scan is mainly used to diagnose lameness because it can show a more highly detailed image of soft tissue than an X-Ray or ultrasound. Although less detailed than MRI, another popular veterinary diagnostic tool is a Computed Tomography (CT) scan. Whereas MRI works by firing radio frequency pulses across a magnetic field, a CT Scan is more or less a 360 degree x-ray image. Check out the video above of Equimagine's horse CT scanner; with robotic arms which move around the patient only a light anaesthetic is needed! In 2006 Russel Guire founded 'Centaur Biomechanics', a revolutionary step forward in improving the performance and welfare of horses. The concept involves using a 300Hz high speed camera and gait analysis software to aid veterinary diagnosis, promote health and enhance performance. Equine Biomechanics allows horse's gait to be quantified, which can then be benchmarked against figures for horses with equal gait patterns and those which don't. By giving greater insights into a horse's movement, equine professionals such as physiotherapists, chiropractors and farriers can provide more targeted treatments and help to give competition horses a winning edge. In 2013 Jonathan Paget won Badminton Horse Trials with a lead of just 0.3 penalties. When margins are this tight, it is worth thinking that adopting such technology could make the difference between first or second place! Arc Equine works by micro current therapy, speeding up the healing process by mimicking a horse's natural electric currents. Managing director of Arc Equine states that the Arc 'acts like a set of jump leads', triggering several metabolic processes within the horse. Tissue formation results from a large mass of similar cells that perform specific functions. Sequences of electric current are passed between these cells to regulate a stable state. It is these very currents that are disrupted when the cells are damaged. This is where Arc Equine steps in, mimicking those electric currents so that normal functions can be continued. In addition to this, it has been scientifically proven that Arc Equine increases Adenosine Triphosphate (ATP) production by up to 400%, which is the primary molecule for storing and transferring energy in cells. Arc Equine can aid the treatment of broken bones, inflammation and sacroiliac to name a few, as well as reducing scar tissue and promoting horse's general health and well being. You can buy Arc Equine in their online shop, we really recommend it! Scientific research carried out by Dr Turner on racehorses in the USA concluded that Equine Thermography can be used to identify areas of injury up to three weeks previous to any clinical symptoms showing. By using high definition imaging anatomical structures can be easily recognised, allowing more targeted tests to be done. Now, anyone can access thermal imagery by purchasing a phone case that transforms your camera phone into a thermal imaging camera. If you detect something suscpicious, you can then easily forward any images you record to your vet or physiotherapist. Follow this link to buy online! For more general information on Equine Thermal Imagery, check out Veterinary Thermal Imagery Ltd.
By monitoring a horse’s heart rate, owners and carers can gain a scientific insight into their horses fitness; allowing them to more effectively train and condition their horses. Most heart rate monitors work by placing electrodes underneath a horses girth during exercise, this allows us to measure heart rate in beats per minute (BMP). Polar is a company which make heart rate monitors and GPS fitness trackers for the human athlete, however they have recently developed a product for the equine market. Check it out on their website! A horses fitness can be assessed by measuring the resting heart rate, the heart rate at full gallop and the recovery heart rate (two minutes after exercise). In the average horse, a resting heart rate is between 28-45 BPM and when exercised at a maximum of between 200-240 BPM. Up until 150 BPM a horse is undergoing aerobic respiration, and above this anaerobic respiration will be occurring. A horse that is in good anaerobic condition, such as a top level event horse, will have a recovery heart rate of about 190BPM. The more fit the horse is, the quicker will his heart rate go down after exercise. The Equinosis Lameness Locator is a technology that has been developed at the University of Missouri from motion analysis algorithms using a high speed camera and horse treadmill. Using precise motion sensors positioned on the top of the horse’s head, pelvis and on the legs, the device enables vets to identify equine lameness; reducing the time from initial evaluation to localisation and subsequent treatment. Equinosis provide an analysis of the horses movement to highlight any lameness, the extent of this lameness and which legs are involved. Equine veterinarian Nicola Pursey, who endorses our Trackener device, uses the Equinosis Lameness locator at her practice 'Farr & Pursey'. Technology within equine medicine is second to none. Gone are the days of diagnosing lameness with just limited X Rays and Ultrasound, most horse owners nowadays will have access to high quality veterinary facilities through their practice to better diagnose their horses health ailments. However, on a day-to-day basis, has technology really had much of an impact on horse health and the way that owners look after their horses? 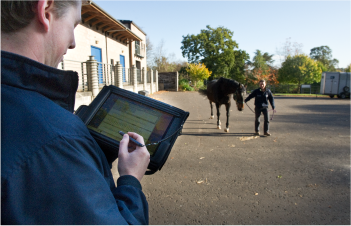 At Trackener we believe that technology can be used around the clock to monitor the health and welfare of horses. Working to the motto of 'prevention is better than cure', our wearable device can both monitor health, detect issues and prevent anxiety. Our wearable device is constantly taking data from your horse 24/7 through its heart rate, mention sensor and GPS. The device and companion app provide the horse owners with a detailed analysis of their horses life, 24 hour hours a day; in the field, stable or under saddle. This allows for early detection of problems, such as colic or lameness as well as allowing you to optimise turnout and exercise sessions. Should yours horse acuire a health problem, Trackener can provide to the vet on-demand insight into the horses health history. This allows for quicker diagnosis and can provide a more tailored treatment. Trackener can help owners to understand their horse better, and help to prevent injury and illness before it is too late. It is the ideal tool, weather you're an amateur horse rider, professional rider or racehorse trainer. If you'd like to be among the first to use Trackener on your horse sign up on our website to receive 30% off your first device! Since, I love horses, so I never miss to choose the right insurance quote for them. It helps making sure about their safety. Thank you for your comment Stella. Insurance is always advisable to prepare for the likelihood of accidents. The risk can also be reduced with Trackener so that we can learn when is the optimal time for turn out etc to prevent situations whereby injury may occur such as fence walking/ boredom activity or changes in behaviour in the stable which may indicate a health problem such as colic.